Hi again, Andrew here and welcome to another episode of the Art of Business English. This week we have a special episode on how to go through an effective decision-making process. If you are like me, then you have to make a lot of decisions at work and many of these are in the form of problem solving. If you find yourself frustrated by a lack of effective problem solving and decision-making procedures at work, then you won’t want to miss this episode. As with most things, decision making and problem solving are skills that can be learnt over time. If you have the right process to follow, then you can make your problem solving and decision making much more effective and rewarding. Let’s kick things off by going over the decision-making process. The first step in the decision-making process is the definition of the outcome or objective. It is crucial that we understand what we want to achieve at the end of the process. Our conclusion will guide us along the path to making the most appropriate decision. 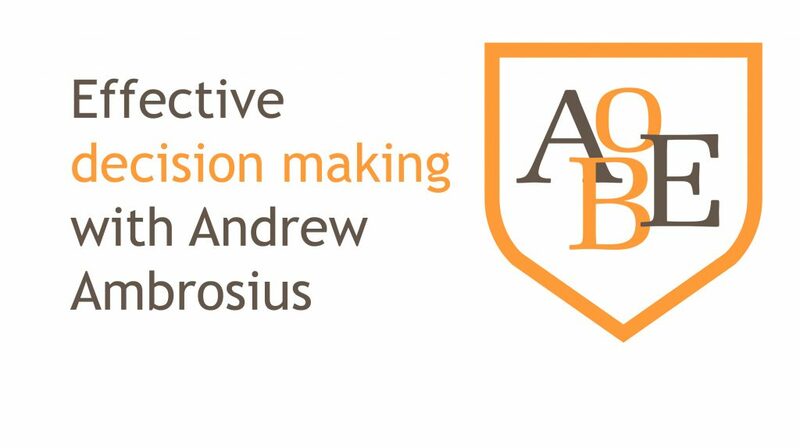 This may seem obvious and you may be thinking, Andrew, you are not telling me anything new here, however from experience, clearly defining the objective is often overlooked. This is also true for decision-making for problem solving. We must first define the problem and then the desired outcome. Once we have the “we are here” and “this is where we want to be” clear, it is much easier to connect the dots. If you are working in a group, then this should be brainstormed together and written up on a whiteboard. If you are working alone, then you should write down your desired outcomes and if you have the time, leave it for a few hours or until the next day so that you can reflect on it. The next step in the process is to collect relevant information. The key word here is relevant. Some people only look at the available information and then make decisions using this. However, when evaluating the information we need to make sure that we classify it as relevant. If we have available information, but it is irrelevant, then it should be discarded. Nowadays we have information overload, and the best decision makers are able to separate themselves and their decision from all of the noise. OK, let’s look at the next step of the process. Here we need to generate all of the feasible options. The most important thing to remember here is that we need to create more than 2 options. We should try and have three or four options. Many people only spend the time to look at two possible outcomes and then go straight ahead and choose between the two alternatives. Our objective is not to choose between the good and bad alternative. Our objective is to choose the best option. For example, if you are recruiting a new person to your company, would you only interview two people? No, of course you wouldn’t, you would interview a number of people and then work the list down to the best person for the position. Remember, the options that you generate must be closely aligned with your desired outcome. The options must also be practical and feasible. So, as a boss you should encourage your team to come up with creative and sometimes even crazy ideas, however, when we evaluate these options they must actually be achievable. The next part of the process is to make a decision. The best way to go about doing this is the following. You must first have a defined selection criterion and these criteria should be given some form of priority or weighting. So, unless an option meets the essential criteria/priority, then it is discarded. Once, all of the options that don’t meet the essential criteria are discarded, then you can look at the other criteria which are non-essential but desired. You can categories your criteria into “highly desirable” and “pleasant addition”. So, simply put you can draw three circles, at the core of the circle, there is the Essential or must have category. The second circle is highly desirable and the third or outer circle the could or might have category. If the risk is calculated, then you should be able to live with the outcome if it is negative. The final part and sometimes most difficult is to implement and evaluate. When implementing a decision, the first step is to make sure you have a general idea of your point of no return or PNR. The PNR is the point when the cost or effort of implementing the decision becomes greater than turning back and changing your mind. This is where evaluation becomes important. When you evaluate the decision and the implementation you can see if the decision was a correct one or not. If you fail to evaluate you may not realise that you have passed your PNR and from here the decision to abandon the implementation is more expensive than continuing. In the next part of the episode we are going to look at some useful decision-making expressions. Here I will give you the expression and then the Spanish translation. Now that you have all of the translations, let’s take a look at some example sentences in context. I think I will go with my gut instinct on this decision, we don’t have time to evaluate all the options. My instinct tells me that the best option would be to cancel the contract and go back to the negotiation table. We are still in the process of weighing up all the options. We don’t want to rush the process. We have a clear outcome in mind. That is a key part of this process. One the one hand I like the first option, however, on the other hand it seems rather expensive. Now, now, let’s hold our horses, we shouldn’t rush into making a decision. Don’t jump to conclusions, we still need to get some more relevant data before we move forward. John, I appreciate your concerns and I think you are right, we need to evaluate the consequences of this decision before we invest more time and money. At the moment we have decided to keep our options open before we go down a specific route. All things considered, I feel that option A is the way forward. Work is stressful at the moment, I am not sure if the company will be sold, so I can’t decide on my future while everything is up in the air! Right, well that brings us to the last part of the episode. I want to quickly look at implementing decision making in your organisation. The first step for implementing effective decision-making in your organisation is to be aware of the process. You can use this episode to guide you. Personally, I feel that decision-making is best done in small groups with key stakeholders in the process. Too many people in a decision-making meeting could lead to no decision being taken. Effective decision-making requires you to have all members in the meeting aware of the steps in the process. Once these steps are clear and everyone knows the path, then the brainstorming can start. This is the best way to start by defining the outcome and objectives. You will also need to make sure that people who prepare data and information are aware of what is considered relevant. Too much data collection will complicate the process. If you don’t have all the information, then you will need to collect it and come back another day. Be ready to slow the decision-making process down. Often an urgent decision is not as urgent as we think. Once you have the relevant information then you can brainstorm the options with the team. Go on to evaluate and make sure it is clear who is responsible for implementation and how this process will take place. Finally, someone needs to take ownership of the decision in case things go wrong. There is nothing worse than people trying to blame each other and not reacting to solve negative outcomes of a decision. Well, that brings us to the end of another episode. I hope you have found the material useful and highly relevant to your daily working life. If you have any comments you wish to share with me then don’t hesitate to let me know. I love your feedback. If you found the episode useful then please share it with your friends and family, I am sure everyone needs a with their decision-making. As always it has been a pleasure having you with me and I look forward to having you again with me next week. Do let me know if you would like to join me for some free coaching on the AOBE. Till next week, take care, bye for now.